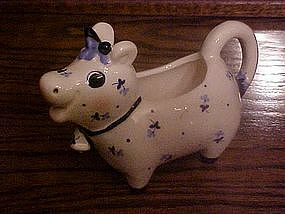 Very sweet cow creamer by Josef Originals. She has two tone blue calico flowers or chintz all over her. She has blushing cheeks and a pretty blue bow and a matching cow bell. She is 4" tall and almost 6" long. She has her original stickers and is in pristine condition.Made of nice glazed ceramic.